Went to movies with Varen last night, we saw The Departed. Cops or Criminals. When you're facing a loaded gun what's the difference? 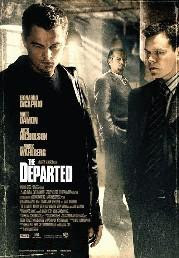 The Departed, the gritty crime drama from director Martin Scorsese, takes us into the lives of two cops: Colin Sullivan, smart and unabashedly ambitious, appears to be on the fast track in the Massachusetts State Police Department's elite Special Investigations Unit, whose prime target is powerful Irish mob boss Frank Costello. Billy Costigan, street-smart and tough, is purported to have a violent temper that costs him his badge and eventually lands him back on the rough streets of South Boston, where he is recruited into Costello's ranks. But neither man is what he seems and, as they work at cross purposes, they are plunged into a dangerous game of cat and mouse in which the stakes could not be higher. So it sounds like a good movie and it sure as hell has a star-studded cast - Yay for Jack being back as a bad guy! But sadly, it failed to deliver. It had some brilliant moments and the acting was good, unfortunately the ending was like a lead balloon. No witty twist as we've come to expect, especially from story-lines that have been so intricately setup. *** spoiler ahead *** But no, no twist ... just a mass extinction of the entire cast! So yes, I've been seeing quite a bit of Varen. It's a strange thing for me, so soon after Bean, but I'm going with it and trying not to over think things too much. It's nice, we have fun together and we might even technically be dating .... it's very strange for me to type that! What's more weird is that whatever is going on with him, believe it or not, doesn't detract from the "Bean & me" storyline of my life. I still think about Bean, a lot. I still love him. I'll hear a song or see something that reminds me of us and I get that sad feeling in the pit of my stomach, the feeling that still can't figure out how we didn't live happily ever after like we were supposed to. We were the perfect couple. But clearly that's often more perception than truth ... and even if the people involved also believed in that perception, it unfortunately doesn't make it any more true. So I have begun my search for the things that were missing, the things that made Bean not quite enough to last me for the rest of my life. And maybe this is something that'll wear off and maybe things won't work out with Varen for different reasons, but for now, I'm just enjoying it. Wow, scary stuff. The unpredictable rollercoaster of life continues.